This is the second part in a two-part series. You should read the first part first. Talking about the application of the smarts contracts within the blockchain and cryptocurrencies industry, they embody business logic within blockchain: the computer programming manages the interactions between the end-user interface and the back-end data systems. The original Bitcoin protocol did not include a facility for smart contracts: the bitcoin blockchain was designed exclusively as a mean for a P2P cash system. The first platform that included smart contracts in its core design was Ethereum: on the Ethereum blockchain, smart contracts are first written using a human readable high-level language, and then compiled or converted into machine-readable code. When a smart contract is deployed on the blockchain, it is copied and deployed on all the participating nodes of the network, and when the smart contract is invoked, all nodes execute the smart contract and thus independently verify the resulting transaction. The importance of smart contracts: independence, savings, security, accuracy. Accuracy. 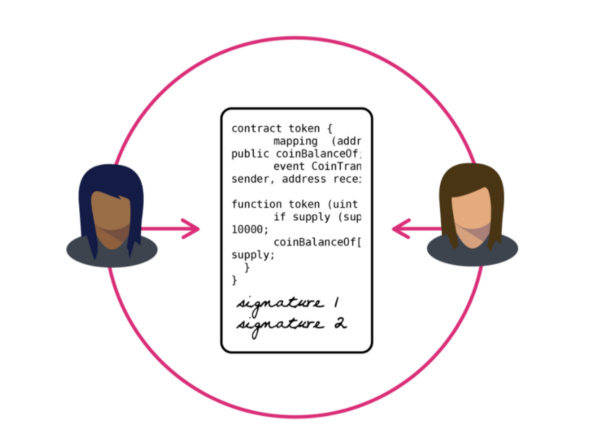 Smart contracts avoid errors due to human intervention and possible incorrect interpretation of the clauses. Smart contracts are a nascent technology: this means that they need a large amount of testing and quality assurance before being deployed. The most common risks of smart contract usage are related to the theft or loss of private keys: since there is no possibility to reset or recreate private keys, users can get locked out of their smart contracts. One way to address this problem? Probably smart contracts that use multi-signatures.